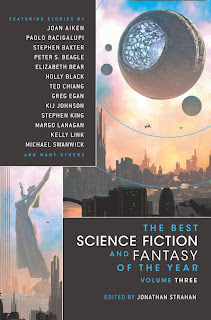 Over at Notes from Coode Street, Jonathan Strahan has announced the contents of Best Science Fiction and Fantasy of the Year, Volume 4 which hits shelves March 29th. I find it very interesting that Tor.com has 4 stories making the anthology. If I'm correct, they've been around for less than a year. Quite a start. I didn't realize that the fiction over there was so strong. I don't typically read a lot of fiction online because I prefer the book form to get away from the screen when possible. Out of the big three F&SF has 5 stories, Asimov's has 4, and Analog 1. That would put Tor.com on pace with any of the big 3 short fiction magazines. Also, congratulations to Alex Irvine and Elizabeth Bear (Keeping An Eye On Authors and friends of the site) on writing stories that made it into the book. Also, all 29 authors happen to be all women, what's up with that? Made you look. Just Kidding!